PVC Doors are available in a range of colours and designs. Doors are suitable for front, side and back entrances. Are you looking to improve your home? Time to replace your front doors and back doors or change a widow to a French door? Looking for value and a complimentary design, then you are at the right place. Our range of PVC doors feature exotic designs and a remarkable outlook. They are high on performance with sturdy resistance against all weather conditions and are durable with guarantee of a lasting life spun. All our PVC doors are made to specifications to come up with a remarkable finish that is top in style and low on maintenance. We are fully aware that every home owner has specific needs and requirements when it comes to matters concerning the most important part of their home –the doors. Also, every home exudes an individual characteristic style that sets it apart from other homes. We put these two matters into consideration to come up with the best PVC doors to suit every particular requirements for different homes. Our PVC doors feature a number of amazing styles and remarkable designs intended for homeowners looking for practical door solutions that are attractive, secure and that offer impressive prices. This is why our PVC doors – including Front doors, Back doors and French doors- are the best option. 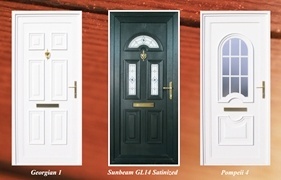 Our stylish selection PVC front doors are the perfect choice in every manner. They offer attractive designs that will surely complement you home’s outer design. They come in varying finishes like white, oak cream and rosewood. Our PVC front doors are reinforced with extra panels for security. To provide for additional security to your family and loved ones, you can add shoot bolts and hooks. That they are low on maintenance and are easy to install on your door frames goes without saying. They make replacing that old wooden door worthwhile. Our PVC back doors are made to order and to measure. Manufactured with Pilkington glass for safety and come with multi point locks to guarantee security. They offer remarkable finishes that include mahogany wood, brown Oak wood, and dark brown rosewood looks among other amazing finishes to order. They are made to measure and come ready to fit. Their installation is astonishingly easy. Imagine the elegance and brilliance of natural lighting to your room and the effect it has of increasing your room space. Imagine the kind of natural sensation you and your guests will experience upon looking out to your garden from within the room. Most homeowners change their windows to pvc French doors. Our PVC French doors will offer this and much more.